How to use Date Function? In this article, you will learn, what SQL Server is. SQL stands for Structured Query Language. This is a computer language, which is used to manage, collect, restore the data in the relational database. Most Relational Database Management Systems like MS SQL Server, Microsoft Access, Oracle, MySQL, DB2, Sybase, Postgre SQL use SQL as a database query language. SQL INSERT is used to insert the records into the database tables. SQL DELETE is used to delete the records from the database tables. SQL SELECT command is used to modify the data in the database tables. When we are executing different type of queries in SQL for any relational database management system, the system finds the short way to finalize your request. SQL Query Engine, Query Dispatcher, Classic Query Engine and Optimization Engine. In SQL process, the first step is parsing. The database parser is a statement when informed by the function means that only the function and not the database can break the number of parses. This includes an independent slice of a SQL statement into a data structure that other techniques are in process. When we generate the function problem for SQL statement, the function generates a parse call to the database to read the statement for the implement. The parse opens or creates a cursor, which holds a parsed SQL statement and other processing information handles the session-specific private SQL area. In the optimization process, Oracle database performs a hard parse at least once for each different DML statement and shows the development during this parse. The database never boosts DDL except it includes a DML element such as a subquery, which requires an optimization. 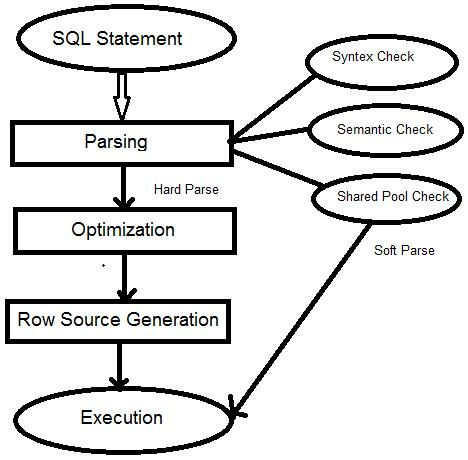 In the execution process, SQL engine implements every row source in the tree originated by the row source author. This step is an essential step in DML processing. Thus, we learned, SQL is used to store a large amount of data.